Keep a look out for some clear promotions you won’t want to miss! 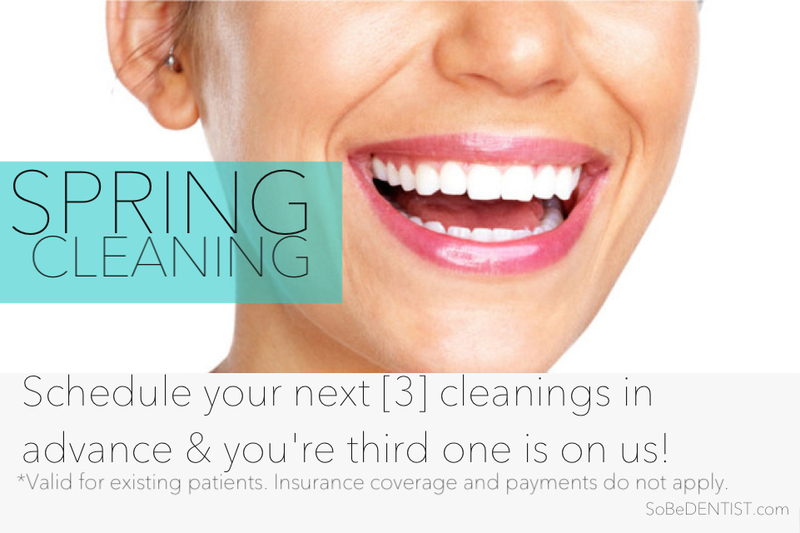 Leave the Spring cleaning to us…. Regular dentist visits can do more than keep your smile attractive – they can tell dentists a lot about your overall health, including whether or not you may be developing a disease like diabetes. New research suggests that the health of your mouth mirrors the condition of your body as a whole. For example, when your mouth is healthy, chances are your overall health is good, too. On the other hand, if you have poor oral health, you may have other health problems. Research also shows that good oral health may actually prevent certain diseases from occurring. According to the Academy of General Dentistry, there is a relationship between gum (periodontal) disease and health complications such as a stroke and heart disease. Women with gum disease also show higher incidences of pre-term, low birth-weight babies. Since most people have regular oral examinations, their dentist may be the first health care provider to diagnose a health problem in its early stages. Oral and facial pain. According to the Office of the Surgeon General, this pain may be largely due to infection of the gums that support the teeth and can lead to tooth loss. Gingivitis, an early stage of gum disease, and advanced gum disease affect more than 75 percent of the U.S. population. Problems with the heart and other major organs.Mouth infections can affect major organs. For example, the heart and heart valves can become inflamed by bacterial endocarditis, a condition that affects people with heart disease or anyone with damaged heart tissue. Digestion problems. Digestion begins with physical and chemical processes in the mouth, and problems here can lead to intestinal failure, irritable bowel syndrome and other digestive disorders. Seeing a dentist regularly helps to keep your mouth in top shape and allows your dentist to watch for developments that may point to other health issues. A dental exam can also detect poor nutrition and hygiene, growth and development problems and improper jaw alignment. Provide your dentist with a complete medical history and inform him or her of any recent health developments, even if they seem unrelated to your oral health. Brush for two to three minutes, at least twice a day, with fluoridated toothpaste. Floss daily to remove plaque from places your toothbrush can’t reach. Eat a healthy diet to provide the nutrients necessary (vitamins A and C, in particular) to prevent gum disease. Avoid cigarettes and smokeless tobacco, which may contribute to gum disease and oral cancer. Exercise preventive care and schedule regular dental checkups — the surest way to detect early signs of periodontal disease. The importance of oral health to overall health. Academy of General Dentistry.